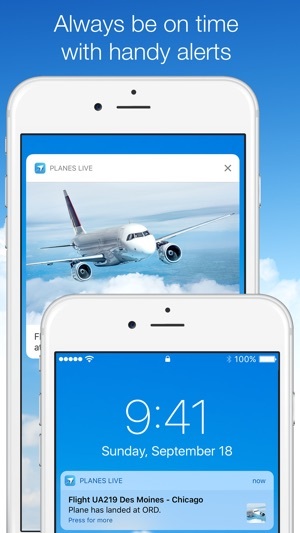 Planes Live is a simple yet powerful flight tracking tool that lets you watch the planes online all over the world and get up-to-date information on flights instantly! Track the flights of your family members or beloved ones as if you were traveling with them and find the best time to pick them up at the airport. Whether you are a professional pilot or an aviation enthusiast, you'll definitely appreciate our flight tracker - the simple, clean and informative interface coupled with powerful functionality! 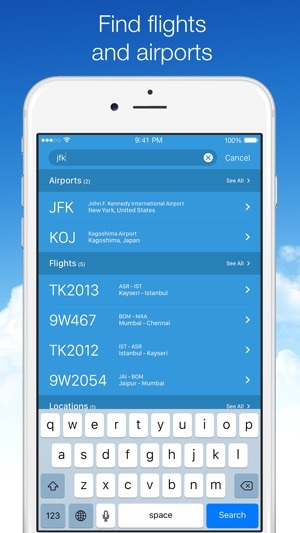 * Add airports and locations to "My Places" to access them instantly! 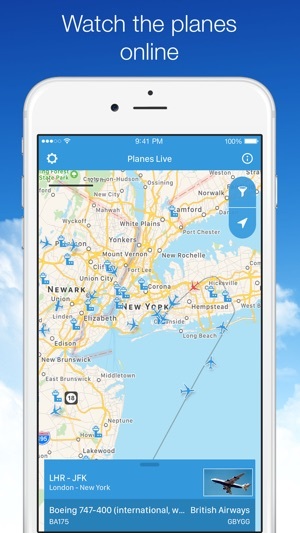 * Spot planes and airports near you: select the desirable distance and enjoy the show! * Apply smart filters to track a particular airplane model or an airline company, watch the planes of selected altitude, speed or airport. Stay connected with your family and friends while they're traveling, plan your own trip effectively or simply track flights for fun in an easy and enjoyable way by using incredible flight tracker app! - Europe: up to 95% of the continent. - South America: up to 90% of ADS-B coverage for airplanes. - North America: close to 100% coverage of transmitter-enabled airplanes; 100% of data delivered with a delay of up to 5 minutes. - Africa: major coverage of South Africa; partial coverage of the rest of the continent. - Asia: coverage of mainly densely populated areas. Together with our partners, we are constantly working on improving the coverage. The airline tracker uses data from several providers, which is collected from aircraft, equipped with ADS-B transmitters. ADS-B is not used by all airlines or aircraft. Due to technical limitations on how flight data is collected, it might be incomplete in some cases. We are working to improve this situation. Ladies and gentlemen, this is your captain speaking. We are flying over the version 1.11 that includes performance and stability improvements. Thank you for choosing "Planes Live"! We're constantly working on making the app better. Wanted to monitor flight WN 184 Southwest Airlines from SMF to LAS. On entering south west in the search bar I was directed to the southwest website. Then tried WN in the search bar and Again was directed to the airlines website. On entering the flight # I received all Europe’s flights. On entering both Arline and number nothing was found rendering the search bars success rather poor. After searching via the airport option I finally found the flight in departures. I requested notifications for the SMF-LAS flight and was given multiple arrivals departures notifications that I did not request including a Burbank - Sacramento flight, Las Vegas - Spokane flight, and finally received the Sacramento - Las Vegas flight. The app does monitor many other flights that do not show on other apps such as freight. I monitor flights in and out of MHR, however, the flights are shown consistently 7 hours ahead of their actual arrival time. Sure it’s minor arithmetic but .... irritating. This pay app has just too many glitches and annoying to navigate. I still use the app as it is far more-comprehensive than other apps, especially in relation to fright flights; however, if you looking for a passenger flight app in the USA, there are a few other pay apps surpass this upgrade from planes live. Thank you for the detailed and honest review. We would really appreciate if you could reach us at support@apalon.com so that we could try to help you with problems with our app. Thanks! I bought this app Tuesday afternoon & being I am the hospital with a bad, painful, blood clot in my right lung I have had time to figure it out. Figuring it out is easy. I just set mine to show the "day/night zones" in "Settings". If you zoom in close where there are lots of plane in an area you can easily pick which one you want to check on. Now due to security reasons it will not show you which runway a plane is landing on but what's the big deal if you don't anyway & if you happen to be waiting at the airport to pick someone up you'll know the flight has landed (no more guessing). 1. Sometimes the plane symbol is pointed the opposite direction the plane is actually traveling and sometimes but rarely a plane isn’t where it actually is. 2. Sometimes though rarely the total travel time is way off, especially on very short flights. 3. Commonly a plane’s true approach to an airport when it gets close in is very inaccurate. From the army Tripler Hospital’s parking lot on the ocean side where I can easily see arriving and departing flights from Honolulu In the mornings I noticed most inter island flights didn’t show up at all with most of inter island departures not showing up at all. The arrivals of all flights appeared pretty accurate. I have seen this wit own 2 eyes. The 4 above issues need to be corrected as soon as possible. Thanks for the positive and detailed review. We will check these inaccuracies on our side in order to come up with a possible solution. Sorry for this inconvenience! 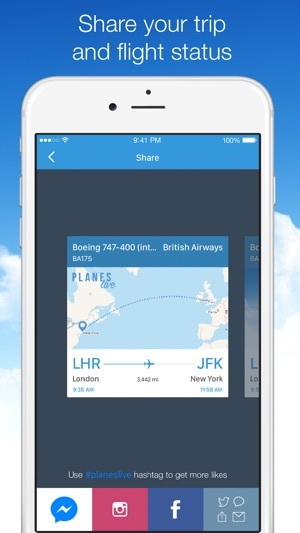 This app does a terrible job of tracking partner airlines. For instance American Airlines flight AA3107 gives no information. Other on line flight trackers show the plane in the air. Once I realized that the flight was Sky West flight SKW230R and followed that flight all the information filled in. I see this as bug in this app. The app should be able to cross reference the two flights and provide the information if it is tracked either as an AA flight or a SKW flight. Airlines tell you the flight is on a partner airline but rarely tell you the partner airlines flight number. Follow up the plane landed in Fort Hood to take on fuel. Glad the wife texted me because this app says nothing. Right now only looking at the app I would have no information, for all I know the plane crashed. Every time I use this app there is a problem. 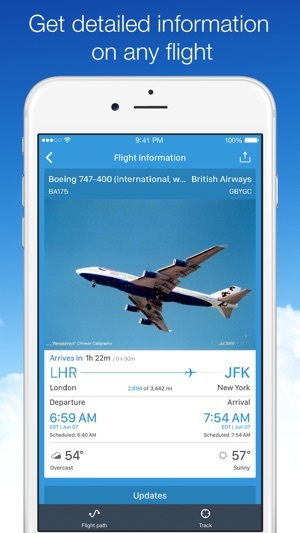 If there are absolutely no problems with a flight, or if the flight is not a partner flight this app is great. If anything goes wrong it is completely useless. As I have previously posted I would give the app zero stars if I could. We're sorry for this inconvenience. We will really appreciate if you can reach us at support@apalon.com and tell us the flight number so that we could check the issue on our side. Thanks!